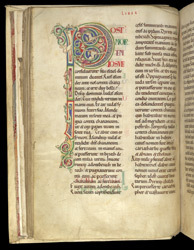 Although it does not have the usual Rochester ownership inscription, the script and decoration of this manuscript are both typical of Rochester manuscripts during their great period of book production in the early 12th century. It appears in the catalogues of the library of Rochester cathedral which were drawn up c.1122/3 and c.1202. This initial 'P' is inhabited by four dog-like creatures and a dragon-like one.